The Midland and South Western Junction Railway experimented with a "Road Train" over the eight miles between Fairford and Cirencester (along what is now the A417 London Road through Ampney Crucis). It was an attempt to gauge support for a possible rail link between the two towns. The "Road Train" consisted of an oil-burning, steam driven motor van capable of carrying up to 3 tons and drawing a trailer for twenty passengers. 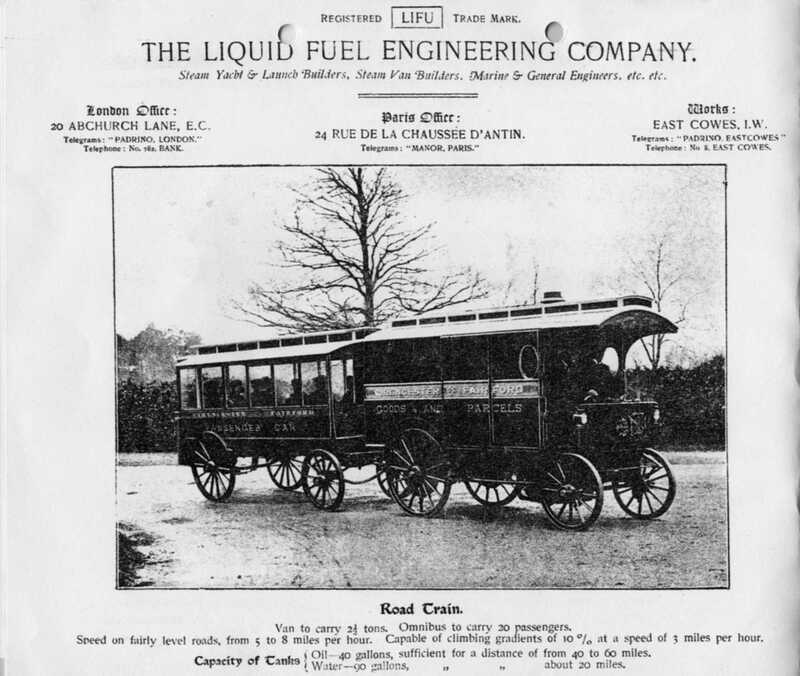 Known as a 'LIFU' (contraction of Liquid Fuel), it was built by the Liquid Fuel Engineering Co. of Cowes, Isle of Wight. It ran during the summer months only in 1898 and l899, when it was extended to Lechlade. The following year a horse bus took over the route. This was the first instance of a Railway bus service. 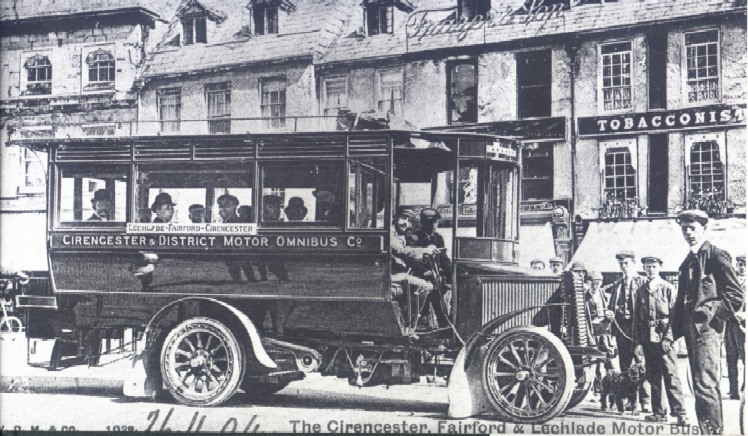 In the period from about 1905 until the First World War, the route was operated by Steam Buses run by Cirencester & District Motor Omnibus Company. We think the bus was a Clarkson steam bus built by Thomas Clarkson of Chelmsford, Essex. 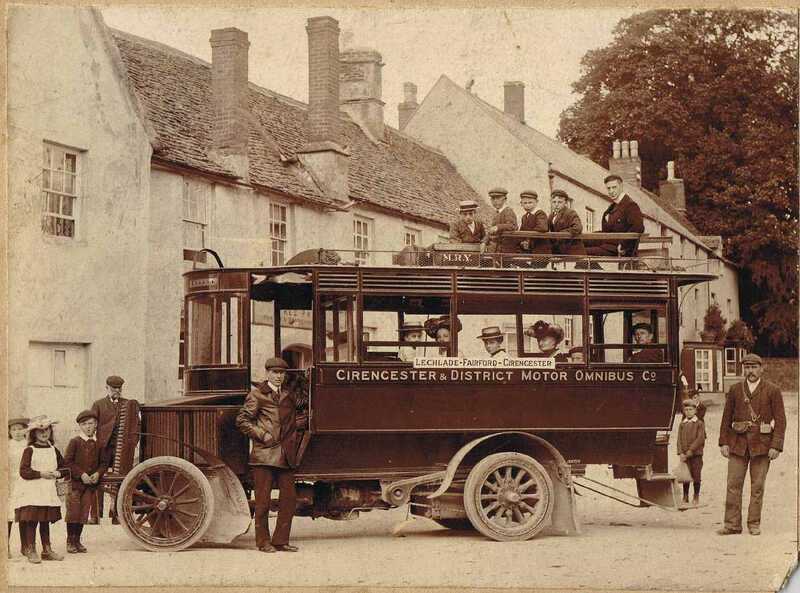 The photos show the steam bus in Cirencester Market Place (hand dated 1904) and outside the Bull Hotel, Fairford. Thanks to Marie De’Ath for the use of this photo. Incidentally, if you think you might have family connections with Marie, especially in Chelmsford, Essex or Lymington, Hants, please contact us.